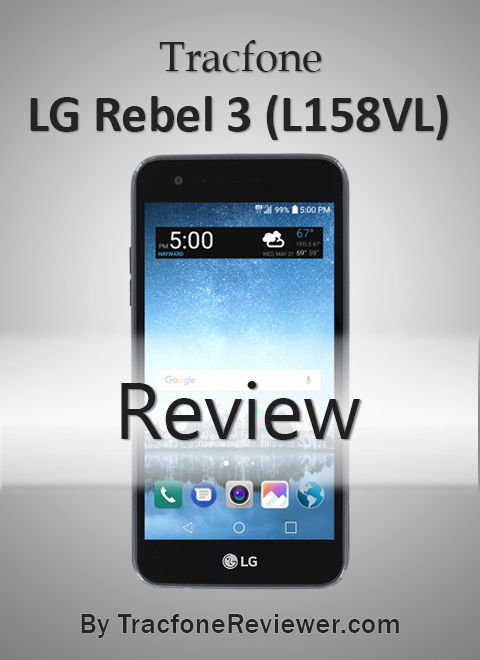 Tracfone LG Rebel 3 (L 158VL/157BL) Review - Specs, Features and More! Welcome to TracfoneReviewer - with news, reviews and much more! 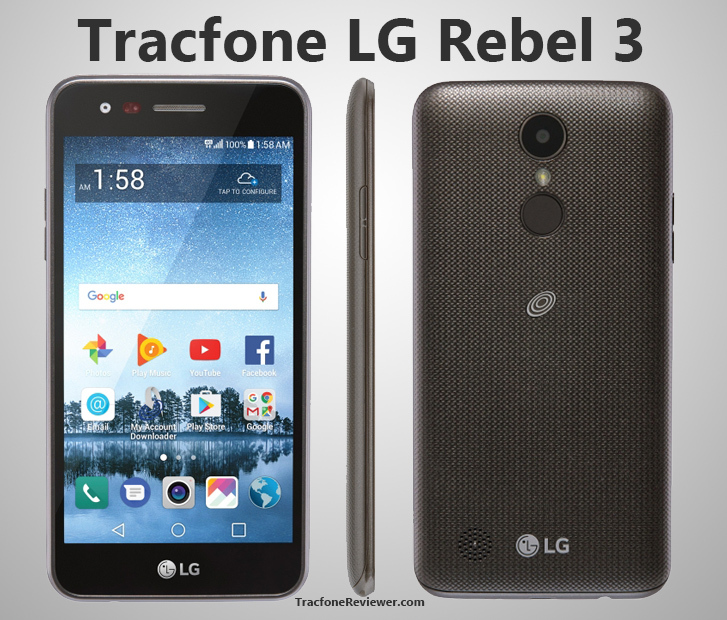 The LG Rebel 3 is now available from Tracfone featuring several significant updates over the older Rebel models that Tracfone still offers. Learn all about what this phone has to offer, how it compares to other Tracfone devices, and where to find it for a great price. 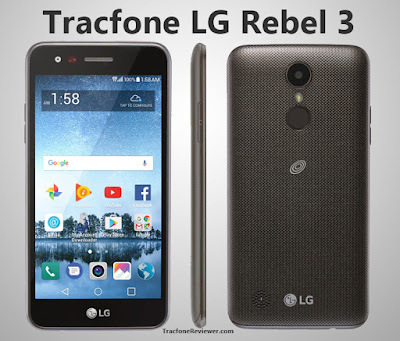 UPDATE - Tracfne now offers a GSM version of the LG Rebel 3 (model L157BL) on the Tracfone website. You will need to enter your ZIP code to confirm it will work in your area. Thanks Anonymous for the heads up! The Rebel 3 comes with a 5" touchscreen, Android 7.0 Nougat, Quad-core processor, 2 GB RAM and 16 GB internal memory. The biggest changes over the older Rebel phones is the extra RAM and internal memory. This phone is one of the first new devices from Tracfone in 2018 and while it doesn't offer any groundbreaking specs at first glance, it is very reasonably priced and will make a great budget smartphone. We expect Tracfone to release several more phones in the near future, and you can find any new phones on our list of Latest Tracfone Smartphones (2018). As with many of the newer phones from Tracfone, the Rebel 3 does not include Triple Minutes for Life which is disappointing. Learn more about these changes in our post, Tracfone Ends Triple Minutes for Life. Let's see the full list of specs now. Size: 5.7" x 2.8" x 0.3"
Several of the features on the LG Rebel 3 are similar to the Rebel 2 (such as the processor and screen size), but there are some improvements that go a long way in making the Rebel 3 much more usable for the majority of consumers. We will look more closely at some phone comparisons further on. LG Electronics is a multinational electronics company based in South Korea that manufactures ans sells a wide variety of devices such as TVs, Appliances, cell phones and more. They are one of the largest smartphone manufacturers and their flagship phone is currently the LG V30, which features a 6" touchscreen, octa-core processor and Android 7.1.2. (And can be used with the Tracfone BYOP program). While the LG Rebel 3 does not have the same performance capabilities as the V30, it is very capable none-the-less, and let's look at each of the main features on this phone. The LG Rebel 3 comes with a 5" TFT touchscreen at a resolution of 480x854. This results in about 195 PPI, which is not quite as good as many phones with this size screen, although many of Tracfone's other devices have similar specs. The Samsung Galaxy Luna Pro, however, has an HD screen with higher resolution at the same 5" size. Brightness and colors are both good on the Rebel 3. Many phones now have larger screens in the 5.5" to 6" range. A larger screen is nice for making it easier to see images and read text, but obviously creates a more bulky device. It may be worthwhile to visit an electronics store and try holding phones with various screen sizes to help choose what size is preferred. The LG Fiesta 2 and Samsung Galaxy Sky Pro both have 5.5" screens. One of the biggest improvements over the previous models is the expanded memory and RAM. the Rebel 3 has 16 GB internal memory which results in about 10 GB usable space for apps, music, pictures and more. Be aware that this space can fill quickly, so the external microSD card slot may come in handy which can hold up to 32GB. The quad-core 1.1 Ghz processor (Qualcomm Snapdragon) and 2 GB RAM give enough power for multitasking and running most games. RAM allows the phone to run multiple apps at once, or run more resource intensive apps. We are happy to see Tracfone offering phones with enough RAM to make the phone effective for most activities. But remember that top of the line smartphones now come with closer to 4-6 GB RAM and octa-core processors. The rear camera on the LG Rebel 3 is 5 MP and features HDR, HD video recording, flash, autofocus, 4x zoom and more. The front facing camera is also 5 MP and has a number of features for selfies including gesture shot, selfie light and cheese shot. Overall the cameras are great for recording and sharing images or video on social media and to share with friends on family. A 2500 mAh battery comes with the Rebel 3 which is on the small side, but fairly typical for phones of this size. Battery life is about 12 hrs with low to moderate use, 11 days on standby. Reducing the screen brightness and putting the phone in airplane mode can go a long way to extending the battery if you are worried about running out. A car charger or external battery pack (like the Anker 10,000 mAh powercore battery) are also great options to always keep your phone powered. 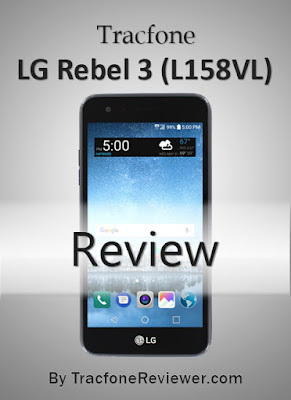 The Rebel 3 comes with the latest Android OS (7.0.1 Nougat) which is good because it is not possible to update the operating system on Tracfone devices. Android 7.0.1 features a number of improvements and appearance changes such as fast app changing (by double tapping the recent apps button), the ability to access notification settings more quickly, bundled notifications and more. One drawback for the Rebel 3 is that it does not include Triple Minutes for Life. This means if you add a regular airtime card (60, 120, etc) it will only give you the amount listed on the card. You can learn more about these changes on our Tracfone Ends Triple Minutes post. UPDATE: Tracfone now offers a GSM version of the Rebel 3. See 'Where to Buy' section for link. As with many of the smartphones from Tracfone, the Rebel 3 uses the CDMA network which is Verizon cell towers and is 4G LTE capable. The Rebel 2 was a GSM version, and we hope that Tracfone will release a GSM variant of the Rebel 3 but that may not happen. Tracfone offers many more CDMA phones than GSM currently. If you are looking for more GSM options, consider the Tracfone BYOP program. With a number of improvements over the previous versions, the Rebel 3 is a well rounded budget smartphone that, at the current price, is a great deal. It has good performance and enough space for most user's needs. Compared to the LG Fiesta 2, the Rebel 3 has a smaller screen, but the same storage, RAM and Android OS. The Fiesta 2 has a 13 MP camera and larger battery. The closest comparison is with the Samsung Galaxy J3 Luna Pro, which also has a 5" screen, 16 GB memory and quad-core processor. The Luna Pro uses the older Android 6.0 and only has 1.5 GB RAM but is a very popular device and performs well for most users. LG Rebel 3 CDMA on HSN with 1500 minutes for $59! That is a very good deal, as the maritime alone is worth $100. This deal may not last for very long. To learn more about the Rebel 3 take a look at the online tutorial for it. Leave a comment below with your thoughts or questions, or join us on Facebook where we share the latest information and you can message us directly with specific questions. Don't miss out on the best Tracfone Deals and Discounts which also includes great unlocked phone options to use with the BYOP program. And see our list of the Best Tracfone Smartphones in 2018! Does this phone have call block? Will service time xfer from a Tracfone to a new replacement Tracfone? The Rebel 2 has call blocking. I assume Rebel 3 does too. phone from hsn you can return it wihin 30 days even if you have activated it. I received this phone yesterday from HSN as a replacement for a Rebel 1. I love the textured back for less slippage.TF makes things easy and cheap. Is the LG Rebel 3 battery the same as the LG Rebel 2? I really miss the feature on my old lgl62v that allowed me to have incoming texts read out loud..i did find an app Read Text to me but it does not read them automatically as they come in. This app just announces who the text is from. However other than that i enjoy the increased gb. Is the rebel 3 the exact same size & layout as the rebel 2? I'm looking for a case for my rebel 3 & all I can find are rebel 2 cases. Just activated Rebel 3 from HSN, replaced Tracfone byop sim phone. Interesting that the minutes tripled even though they aren't supposed to, $60 for 4500 min with year of service is a no brainer, several others have also reported getting triple minutes with activation of this phone. I also got this phone from HSN and when I transferred my service from current Tracfone to this one I also got everything in the bundle tripled. A very nice surprise indeed. I upgraded from a Rebel 2 which was working fine but with the deal from HSN it was a no-brainer to upgrade! Getting everything tripled was just the cherry on top. I received 4500 minutes and 5 GB of data when I turned on my new Rebel3 from HSN is this common? What a deal! The Rebel 3 does have hot spot capabilities. It is also exactly the same size as a rebel 2. Seems like the triple thing may be a glitch and who knows how many got it, I'm just glad I did! I may have figured out why some purchasers got triple minutes. I read on QVC website(answer to a question posted) that if you had a tracfone with triple minutes for life and transferred that number and service to a new tracfone then it would continue the TMFL feature. I'm sure that is probably what happened in my case, my wife's old phone was a Motorola from a few years ago and I think it did have the TMFL feature. For what it's worth, mystery solved(maybe). I got the Rebel 3 because the store manager told me that I could now longer get the type of phone that I had. He told me that the Rebel 3 was the best of the phone I was looking at. The problem with my phone is that I got it on March 9 of this year and in three weeks I am on my third sim card and it has taken 10 days for my replacement to get here. This is by far the worst phone I have gotten from Tracphone. Can tell we why the card goes bad just send me a new card. This is B.S. Does it have compass/accelerometer/LED notification light? Update your review. Tracfone does offer this in a GSM version. It's model LGL157BL, and I'm holding one in my hand. And Tracfone also uses your zip code location to filter out models, even though they may work in your area. When the page loads to view phones they sell, kill the page loading after the phones load but before the zip code verification window pops up. This may take a few times to get right, but you'll see phones you wouldn't otherwise. It's how I got a Rebel 3. They don't offer it to me if I entered a zip code in that first pop-up window, but once I clicked on the Rebel 3 model link, and chose to enter a zip code from there it allowed me to purchase it. Also, my existing phone was a Tracfone GSM model(AT&T line/carrier), and tyhat may be why they sent out a LGL157BL instead of the CDMA model LGL158VL. YES it should. I was able to transfer my number, minutes, text and data all from the Rebel3 set up system and didn't have to deal with TracFones less than desirable Customer Service. Thanks for the review. Had been planning on getting a 3rd J3 Luna Pro for my son, my wife and I each have one, but this one looks nice as well. Only thing holding me back is the low SD screen resolution, J3 is 720p. Everything else about the phone is so nice and new - 16GB storage, 2GB RAM, Android 7.0 - not sure why they would cheap out on the screen, guess it's a big cost saver. This may be a dumb question, but since I'm somewhat technically challenged, I'll ask. Can I use the wall charger from my old LG440G flip phone on my new Rebel 3 smart phone? Thanks. If the little plug fits into your phone jack it should be fine. Confirmed battery from the LG Rebel 2 is the same for the LG Rebel 3. I had to buy the L157 GSM version after not having even a bar of signal with my LG Rebel 2 L58VL CDMA Verizon. I thought LTE would have covered my area but not so. Verizon's maps are a flat lie of coverage of their phones so get a friend's phone before buying to test your area. Purchased many of the low cost LG Rebel 2 L58VL units from HSN when they had real low prices with the first time buyer discount so while not getting Triple Minutes option, i can use this LG Rebel 3 L157 as long as it lasts and have a total of 4 batteries to use in it! Thanks HSN and Tracfone! Now hope Tracfone doesn't leave the USA when we smack the big tariff on their goods! Did you activate online or by phone? Thanks. I do no know how to get Google assistant to work. Phone will not speak to me. My old phone was a LG L41C Ultimate 2. After using my Rebel 3 for a week it has proven to be a big step up as far as 4G LTE, screen size, RAM, internal memory, and Android 7.0.1. But, I was very disappointed to find that several apps that worked on my old phone will not work on the Rebel 3. There is no compass function on this phone. Apps that require azimuth/elevation orientation will not function. One example is Smart Tools, https://play.google.com/store/apps/details?id=kr.aboy.tools . This app contains an inclinometer, plus the ability to measure height of an object by pointing the camera, etc. The Google Play store confirms that Smart Tools isn't appropriate for download on a Rebel 3. Several other apps downloaded but failed to work correctly because of no compass mode in the Rebel 3. There are good features about the LG Rebel 3, but Tracfone does not back it up with accurate information about the compatibility for reception in my area. I cannot make or receive calls in my home area even though the phone is advertised as getting reception in this area. Very unhappy with the phone service and Tracfone's lack of tech support and problem resolution.